Nacho Patrol has, as of late, been disillusioned. Everywhere we turn, we are submerged in a sea of cheese sauce. Our arteries simply can’t take it anymore! One more plate of slimy, high fat, liquefied cheese and Nacho Patrol will be checking into the nearest hospital for multiple triple bypasses. Our noble quest for nacho perfection will be for naught, our mission forever lost in the annals of Internet history! Appearance: (7.5) Nacho Patrol appreciates fresh tomatoes on our nachos. It adds a kick of color and a clean, healthy taste to what usually is a caloric minefield. 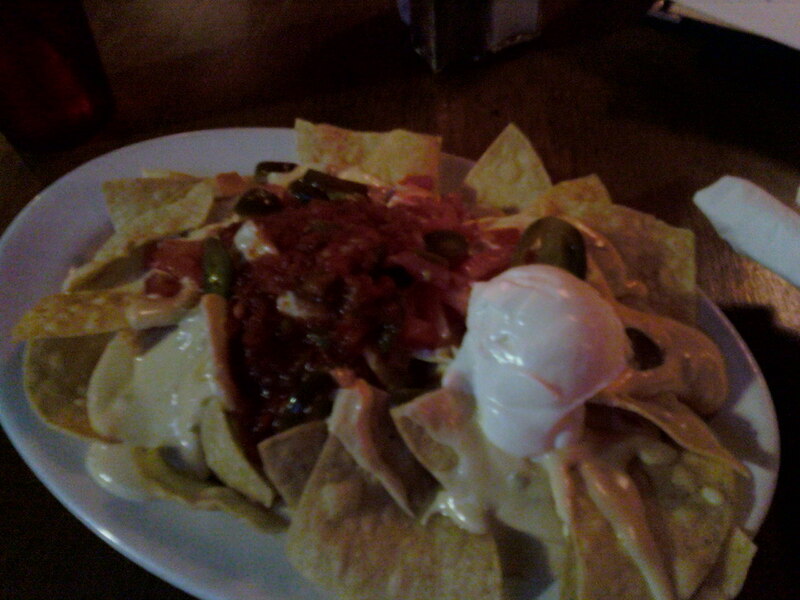 The salsa, olives, and sour cream also did a lot to distract from the pale, cheesy mess soaking our nachos. Generally, an appetizing-looking arrangement of colors and textures, but certainly not helped by the queso. Quality of ingredients: (6) Again, none of the nacho staples were particularly off (good tomatoes, salsa, olives, jalapenos, sour cream, etc). It was the cheese sauce that tainted what could have been a fine example of “Irish” nachos. Sure, it was probably tediously melted in-house, but that doesn’t change the fact that cheese sauce is, by its nature, too salty, too viscous, and simply too soupy to enjoy. As we grasp for a glass of water, the nachos leave us feeling like we might have just taken 5 years off of our lives. MGH should keep a room open for us. Distribution: ( 7 ) As always, the goes-anywhere nature of cheese sauce makes for perfect distribution. We wish we could have reviewed the placement of the chili, but as it was forgotten and later added, we can’t comment on it’s distribution. Price: (5) $10, which is apparently the standard of sub-par bar nachos in Boston. We expect more. It’s official. We hate Boston’s fake-Irish bars. We get it, Glynn Hospitality Group–you want to bank on that tough, hard-drinking, Colin Farrell vibe that tourists just love. Unfortunately, it’s just plain boring. If Nacho Patrol was in government, we’d set up new zoning laws that would only allow these crap shoots every other block, instead of every ten feet. We’d also create an ordinance that banned queso dip everywhere but Border Cafe. All this ranting has given us chest pains. Someone call 911.
nachopatrol.com, how do you do it?